Prior to Georges St-Pierre inking a new contract to return to the UFC, welterweight champion Tyron Woodley was angling for a chance to add another title to his collection against current middleweight king Michael Bisping. Ultimately the fight didn’t come together as Woodley defeated Stephen “Wonderboy” Thompson at UFC 209 while Bisping was locked into a fight with St-Pierre once he was officially back on the roster. While no date has been made for the fight, Bisping recently offered St-Pierre an ultimatum to either step up and face him this summer or risk losing the shot at the title altogether as rumors persist that the former welterweight champion is looking to fight closer to September or October. 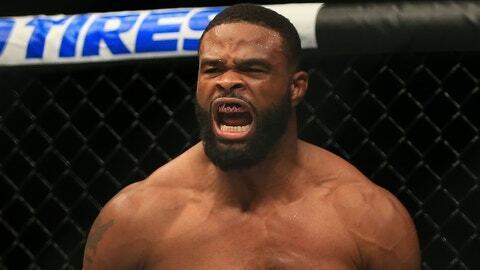 With a potential opening on Bisping’s schedule and the middleweight champion specifically mentioning his wish to fight at UFC 213 on July 8, Woodley is more than happy to throw his name back into the ring for that super fight. “I think that if you make the fight, you say you’re going to fight this individual, July’s a great date, International Fight Week, you take the fight then. I don’t know when this September thing is coming in. I think Georges St-Pierre’s playing games with us. He didn’t want to fight me. He went up to middleweight, talking about going down to lightweight. It didn’t take long for Bisping to hear Woodley’s offer and then make his remark about the matchup that would pit champion against champion in the UFC. “Tyron, I’ve no interest in shadow boxing for 25 minutes against you. I need someone who engages/actually fights,” Bisping stated on Twitter. A moment later, Woodley returned fire. @bisping @UFCTonight @FS1 then don't dance and play Karate kid like Stevie Wonder. Don't be scared come catch this fade. Or keep running! It’s easy to see this war of words isn’t going to slow down anytime soon, but if St-Pierre isn’t ready by July it certainly seems like Woodley is more than happy to take his place.